Ricinus Communis Seed Oil (40-65%) (and) Hydrogenated Castor Oil (20-40%) (and) Ethylhexyl Palmitate (10-25%) (and) Euphorbia Cerifera Wax (5-15%). 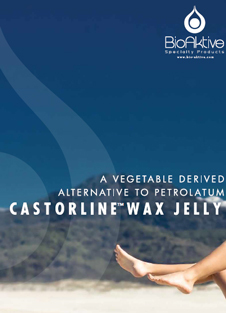 CASTORLINE™ WAX JELLY by BioAktive Speciality Products is a vegetal derived wax. It is a soft, silky, stable and creamy light tan petroleum jelly replacement using naturally derived materials. It spreads smoothly, and exhibits low tack, firm consistency fatty acids, fatty alcohols, glycerides, hydrocarbons, synthetic waxes and most other waxes, resins and oils. 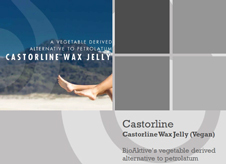 CASTORLINE™ WAX JELLY is used in lipsticks, lip balms, creams, lotions, stick pencils, shaving creams, mascaras, makeup and sunscreens. It is listed under TSCA and DSL. The shelf life is of 2 years.